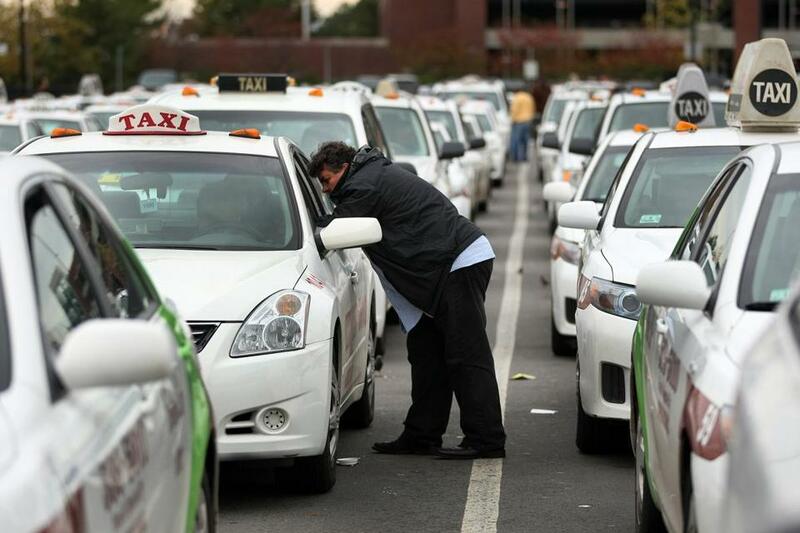 Many taxi drivers considered the arrival of Uber and Lyft at Logan as a death knell. The airport had been the one place where they were protected against competition by app-based ride-hailing operations. Taxis are still king at Logan International Airport, but maybe not for much longer. Cab drivers have seen a 10 percent reduction in the number of rides at the airport since February, when the ride-hailing companies Uber and Lyft were first allowed to pick up passengers, according to the Massachusetts Port Authority. Massport, which operates Logan, reported Monday on the first six months of ride-hail services at the airport. Taxis still had more fares than ride-hailing services: an average of 5,735 daily for cabbies, compared to 4,686 for ride-hail services. But business is quickly trending against taxis and in favor of Uber and Lyft. In February, 12.5 percent of all passengers arriving at Logan left the airport with one of the two companies. By July, that number was up to 18.4 percent. Public transit ridership at the airport also slipped slightly during the period. Massport’s chief executive, Thomas Glynn, said the data show “that the taxi industry has been able to weather the storm so far,” but he acknowledged it has lost business. Steve Goldberg, president of the Boston Taxi Owners Association, was less sanguine. He said he believes that Uber and Lyft are already supplying more Logan rides than taxis are in August, and that ride-hail companies have an unfair advantage at the airport. He suspects passengers use the services because they are often cheaper than a cab, but pointed out that taxi companies have no flexibility to set their own rates and offer passengers lower fares. While Uber and Lyft have always been able to take passengers to Logan, they were barred from picking people up at the airport until earlier this year, after the state began checking drivers’ backgrounds. Previously, only Uber drivers who were licensed as livery drivers could be summoned by passengers using an app. Yet livery drivers are also providing fewer rides since operations like Uber and Lyft began picking up at Logan, Glynn said, though he did not provide exact figures. But the numbers don’t tell a complete story, he said, because many licensed livery drivers who also drive for Uber are included in Uber statistics. For taxi drivers, the arrival in February of ride-hail drivers at Logan was a death knell: The airport was the one last place where they were insulated from such competition. Allowing ride-hail services at Logan has resulted in a sharp increase in the number of passengers using car services to leave the airport this year. Since February, taxis, limos, and ride-hail companies have combined for more than 366,000 monthly pickups, compared to an average of about 289,000 during the first half of 2016. Ridership on Logan Express shuttles, buses that carry people between the airport and suburban parking lots, is also up, by about 5 percent this year. But on the MBTA, Blue Line ridership at the airport was down almost 1 percent compared to 2016, and ridership on the Silver Line at Logan was down 2.7 percent earlier this year, according to Massport. Glynn said that more passengers may be opting for hired rides because of Massachusetts Turnpike and Sumner Tunnel highway work.